HDD Spotlight Bargain: '13 Assassins' Blu-ray $17.99 at Amazon! Save forty percent on the samurai epic from legendary Japanese filmmaker Takashi Miike ('Audition')! 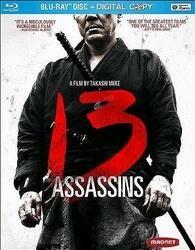 The online retailer is selling '13 Assassins' for $17.99 (40% off suggested list price). The film was nominated for ten Awards of the Japanese Academy including Best Screenplay, Best Director, and Best Film and won four - Best Art Direction, Best Cinematography, Best Lighting, and Best Sound. Takashi Miike was also nominated for the Golden Lion at the 2010 Venice Film Festival. So if you liike Miike, then click here!